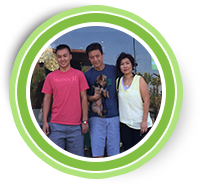 Pinkberry started in Los Angeles, CA in 2005 and has enjoyed unprecedented growth to over 100 stores nationwide. Known as the original frozen yogurt, we reignited the frozen yogurt phenomenon. With consumers focused more than ever on healthier options for a frozen treat, now is a great time to own your own frozen yogurt franchise! Ready to own your own Pinkberry franchise? Contact our development team to discuss great opportunities today. We believe in continuously raising the bar on the quality of our products and everything we do. We believe in fostering meaningful connections between our brand and its franchisees, customers and communities. We understand our brands and we serve with humility and gratitude. We believe in innovative ways for us as Franchisor and for you as Franchisee to attract, train and retain outstanding Team Members – people are our brand’s future and strongest asset. We believe everyone should act with a sense of urgency and have the courage to take calculated risks, solve problems and innovate. We believe in growth and profit as the engine to achieve our dreams. Pinkberry locations range from 400-1,500 square feet in size, including traditional street front, kiosks, in-line locations, and more. You can find Pinkberry stores in neighborhoods, shopping centers, malls, airports, and even on college campuses. We are flexible with store design and collaborate with our franchisees to find the best way to build a branded environment in the space they have to work with. Whatever the format, we create unmistakably inspired Pinkberry experiences. A minimum liquidity of $100,000 a minimum net worth of $250,000, and ability to access credit. Live in the local market and have superior customer service, extensive operations, and strong store management experience. Share Pinkberry values to exceed customer expectations, and believe in distinct products, outstanding service, and inspirational design. Find out how you can become a Pinkberry franchise owner now. Please click below to request franchise information. Q: Is Pinkberry looking to franchise within the U.S.? A: Yes. Pinkberry is strategically poised for expansion and continues to seek long-term relationships with qualified multi-unit and single shop operators. Q: What kind of support do you provide Pinkberry Franchisees? A: Franchisees have dedicated operations, marketing, and development support team members who they can reach out to for operating and training matters. Franchisees undergo immersion to the brand, design, construction operations, and real estate upon franchise agreement signing. Leading up to opening your first store, there will be comprehensive field training for key positions, then Field Trainers will come to market to assist you in opening the store. Pinkberry offers our franchisees a comprehensive training program—80 hours of hands-on training at a Certified Training Store and 5 days of classroom training at our Kahala Headquarters in Scottsdale, AZ. Combined, the Pinkberry training program is designed to prepare our franchisees to train, lead and inspire their teams to successfully deliver on our Pinkberry commitment to distinctive products and outstanding service. During the new store opening process, the Pinkberry Operations Team continues the training support, working closely with our franchisees to prepare stores and store teams for successful openings that set the course for amazing ongoing daily operations. Q: What is your franchise fee? Q: What are your royalty and marketing fees? A: Pinkberry Royalty Fee is 6% of gross sales. The national Marketing Fee in the United States is 2% of gross sales and local advertising requirement is 2% of gross sales. Q: What Real Estate is available now? Will you find the Real Estate for me? A: We provide training and provide support and guidance through the process, however, the franchisee takes primary responsibility to source Real Estate. Q: How do I get a copy of your Franchise Disclosure Document (FDD)? A: In order to receive a copy of Pinkberry’s Franchise Disclosure Document (FDD), please complete the online Franchise Inquiry Form. This is the first step in having a conversation. Once we have received and reviewed your completed application, we will respond to you with our criteria, or have a representative contact you directly. We will then send out our FDD to qualified candidates. Q: Can I open up just one Pinkberry in my neighborhood? A: The term of the License Agreement is generally for 10 years with a 15 year renewal if licensee is in good standing and other conditions are satisfied. Q: I am very interested. What is my next step? 1) A Pinkberry representative will consider your initial application based on your previous retail operations or leadership experience, your financial capability and your passion for Pinkberry. 2) Based on your qualifications and interest we may set up an exploratory telephone call for us to learn more about each other.